Learn to paint the Big Blue Heron in Acrylics when we will be guests of Local by Design Annapolis Mall. This is a beginners painting class , with heron and palette pre determined so you can focus on learning to paint! The big blue heron will be pre drawn on your 16 by 20 canvas. Over the next 2.5 hour class we will show you how to mix colors, paint for texture and complete your acrylic blue heron. 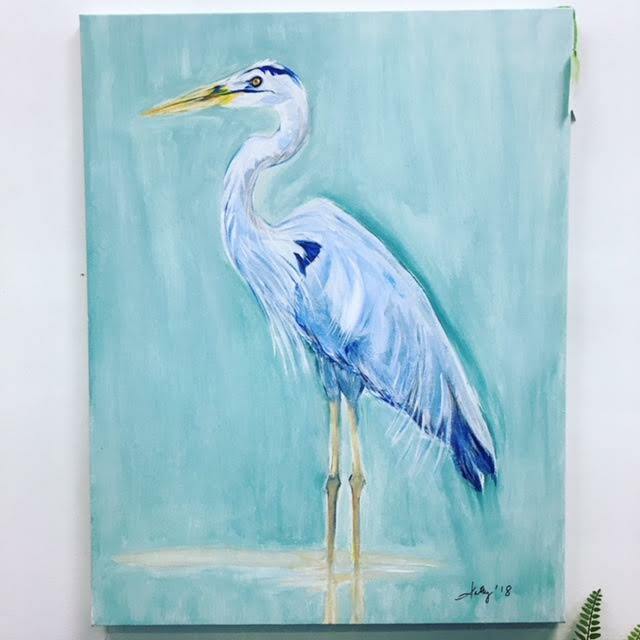 You will leave the mall, not only with a new skill set and appreciation for painting but your very own big blue heron to take home! We do supply aprons but dress accordingly for acrylics do not come out of clothing. All materials and instruction included must sign up online or at the Annapolis Mall. Men and kids over ten, welcome to learn and create in our art class – just 50 dollars per person.